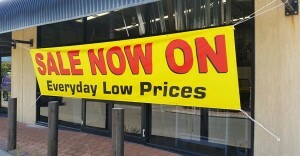 PVC banners are the most common type of banner and here at Banners Perth we make them day in and day out. Our banners are super strong, super vibrant and last the distance. With our state of the art printers and production processes, our PVC banners will get your message across. We manufacture banners with ropes and eyelets as standard, but you can have different options like pockets, hems and even velcro. You can have full colour images or text or even a combination of the two. In fact, no matter what you put on your banner, the price doesn’t change. What sizes can banners be made in? This is a common question and the answer is simple – any size! Because PVC banners are made from a strong woven PVC, they can be welded together to create billboard sizes, around 10m x 5m. Of course, we can even go bigger if need be, but there’s no restriction on size. Why are they called PVC banners? The clue is in the name. PVC stands for poly vinyl chloride and it refers to the coating that goes over the weave in the material. 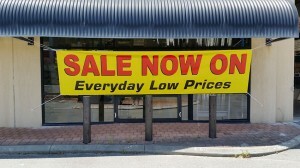 Using PVC allows banners to be used outdoors and creates a perfect surface for inks to adhere to. If you have PVC banners or vinyl banners you require, please head to our contact page and ask us for a quote. Our friendly team are ready to assist with your banner needs. This entry was posted in Vinyl Banners and tagged PVC Banners Perth, Vinyl Banners, Vinyl Banners Perth by Banners Perth Staff. Bookmark the permalink.